Japan Coming of Age Day is celebrated the second Monday in January. The day celebrates Japanese people who turn 20 years old which allows them to vote and drink and in the eyes of society. 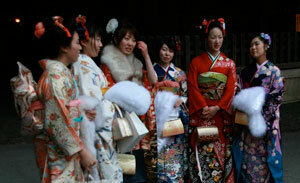 Women celebrate by wearing kimonos with long sleeves as opposed to short sleeves for married and mature women. Men wear classic business suits or some go with the traditional kimonos. This holiday began back in 1948 officially as a holiday but with the traditional roots of the coming of age day way back in history with youth younger than 20 years old celebrating their emergence to adulthood.